The background behind the start-up of Legend picks dates back to the late 1980's when I was casually looking around the music industry to purchase a small quantity of imprinted picks for myself to be handed out by my local band and distributed as a novelty item. Like most folks who had gathered a hand-full of souvenir concert picks, I liked the concept and thought that having my own personalized picks would be a nice touch for my "Last Iowa Exit" band. To my surprise, it was very difficult to locate a source for such an item. I checked with my local music stores and even went as far as traveling to Chicago in an attempt to find a store that could either provide me with a product or at least give me a lead as to where such an item could be purchased. Most of the avenues led nowhere; however, I did find out that I could purchase either a minimum of 10-gross ( 1,440 picks) through one of the many music wholesale suppliers or I could purchase a lesser quantity from a couple of outfits located on the east coast. The problem with these two options was first that I didn't really need, or want 1,000 plus picks, and second the suppliers on the east only offered "block lettering" imprints with the standard three lines of imprinting along with the limitation of printing a maximum of nine letters/numbers per line. Frustration set in and I began exploring the concept of purchasing picks and having them imprinted locally by either a screen printing or hot-stamping establishment. Well, I did follow through with this notion and had a couple of jobs printed up locally; however, because of the nature of printing on such a small item as a guitar pick, requiring detailed designs, and having to consistently print the design perfectly in the same place on each item caused the local printing businesses to raise prices up to the point where it became ridiculous. One of the primary reasons for starting the company was to maintain an interest in the music/entertainment business and to open up avenues to develop contacts with professional musicians, tour managers, and "hands-on" technical roadies. Another significant reason for initially starting and continually expanding Legend Picks was as a means to provide fellow musicians the ability to purchase reasonably low quantities of quality imprinted guitar picks at prices below the usual amount that is charged at the corner music store for a standard pick. Legend Picks is the best in the business... both in terms of quality and price. I work very closely with our customers to ensure that we provide products to exactly meet the desired specs, and I personally quality check each and every pick leaving our office to ensure that no "seconds" make to the customer's hands. The quality of our product is reflected by the fact that we have continuing initial and refill orders from thousands of customers, to include some of the biggest artists in the music business. I have always had the aspiration to be involved in the music business. I began playing guitar at age 4. At the encouragement of my guitar teacher, Mrs. Arlene Bolis, I started teaching guitar in my home at age 15. Mrs. Bolis also opened the door for me to start teaching guitar at Bowlby Music (Rock Island and East Moline, IL) for Mr. Gail Johnson at age 16. I additionally worked sales and performed guitar repair at Bowlby's. I then taught guitar at Circle "M" Music in Kirksville, MO, while studying business/accounting at Truman Stage University. I played in various bands through the years starting with my first bar gig at Emmet's Pub in Moline at age 18. This guitar pick venture is my small contribution to the music industry. It allows me to keep a foot in the door and opportunity to meet and build relationships with some very prominent and respected musicians and music business associates throughout the world. Managing and operating Legend Picks continues to give me great pleasure and pride. It has been fun and exciting to take this concept from my initial niche of offering low volume orders of premium quality customized/imprinted guitar picks to a company that now has a world-wide customer base and endorsements from many top artists. I am spending more time in Nashville and LA as I prepare to open new custom pick shoppes. I am also playing with new bands and am working up on a duo project so I can focus on more acoustic music. My vision for Legend Picks originated in the late 80’s when I was a graduate student in the M.B.A. program at St. Ambrose University. I currently manage and operate Legend Picks' operations and play a daily "hands-on" role. Basically, I do it all. I retired from the Federal Government in August 2012 at age 50 after almost 29-years of service to pursue other projects and goals, one if which was to increase the quality of my Legend Picks service and to take on larger and rush orders. My education includes a B.S. in Business/Accounting from Missouri (Truman) State University (1983) and an M.B.A. from Saint Ambrose University (1990). ~ Started guitar lessons at age four at Bowlby Music where I later worked and taught guitar. ~ Took guitar lessons and cello lessons (Audubon Grade School) from Mr. Ray Flanagan. 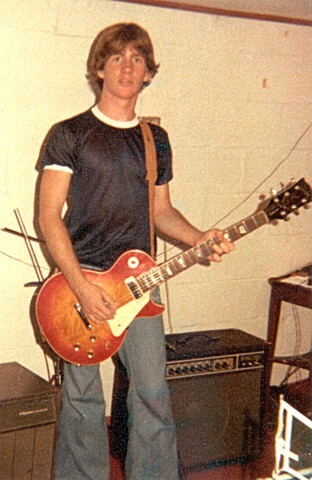 ~ In 1977 at age 15 my parents took me to Gary's Music Mart in Silvis to purchase a cherry sunburst Les Paul Deluxe and Roland JC 60 amp (seen below). ~ My music preferences are Classic Rock and Motown (Spinners) . ~ First album purchased was Gary Wright's Dream Weaver. ~ Favorite place to watch a concert ~ side-stage at World Music Theatre, Frankfort, IL. ~ First concert ~ Styx / ARS with uncle Rudy Rexroth and Greg Youngberg on January 8th, 1977, at the RKO Orpheum Theatre in Davenport, IA. ~ Longest day of playing music - 19th birthday, played four sets for a wedding reception in afternoon then four sets at “Dirty Dicks” bar in Andalusia the same evening. ~ Classic bar memories – During version of “You really got me” at Dirty Dicks bar I hid behind my amp while playing the tapping solo and drummer Gary Wethington grabbed a plastic guitar and came out front mocking playing the guitar. I think that was the same night that we set off some explosives that filled the entire bar with smoke. We had to stop playing and evacuate the bar. ~ Special thanks to my parents for getting me into music at age four, signing me up to play the cello starting in 4th grade, encouraging me all along the way, paying for lessons and buying me a Les Paul and amp at the young age of 15. And I greatly appreciate the support and mentoring from Mrs. Arlene Bolis, Mr. Ray Flanagan (guitar and cello teacher), Mr. Gail Johnson (owner of Bowlby Music) and all the musicians I have played with over the years. Cheers!